Would you have thought that hot cross buns have a long historical background? It seems that they do. There is some thought that they go back to Anglo Saxon pagan times when Eostre was the goddess of spring and dawn. In the spring, dried fruits would be put into the bread dough and be baked into small loaves to honor the goddess. As time passed and Christianity expanded, the loaves would be baked by monks and have the sign of the cross marked on the top of the loaf. 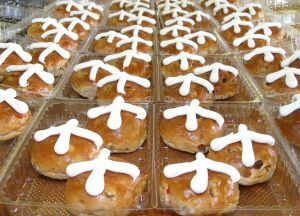 How the buns became the breakfast of choice on Good Friday is not entirely clear. There are some references that the buns were baked on Good Friday morning because Lent was over and eggs could be eaten (or used in baking) again. In other references, it was because during the Tudor reign in England they tried to ban the buns all together because of their association with the Catholic Church. It was found that the buns were too popular to ban completely. The ban was lifted for Easter, Christmas, and funerals. Over time, the cross on the top of the bun was changed from being and indentation in the bun to being a pastry cross on the top of the bun. Also, they were just called “cross buns” until there were vendors selling the buns on the street that were still warm or “hot”. They were then called hot cross buns. I think I need to go to the bakery now. This entry was posted in Writing and Photo Prompt Responses and tagged BlogHer Challenge, Eostre, Good Friday, hot cross buns. Bookmark the permalink. I’ve always wondered what hot cross buns looked like. I still sang the song as a kid but had no idea what I was talking about.